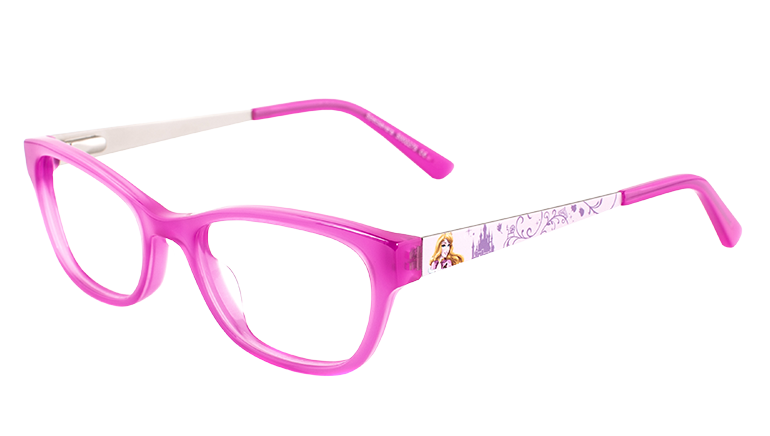 We’ve got six beautiful new additions to the Disney Princess collection, with a variety of pretty styles to choose from. 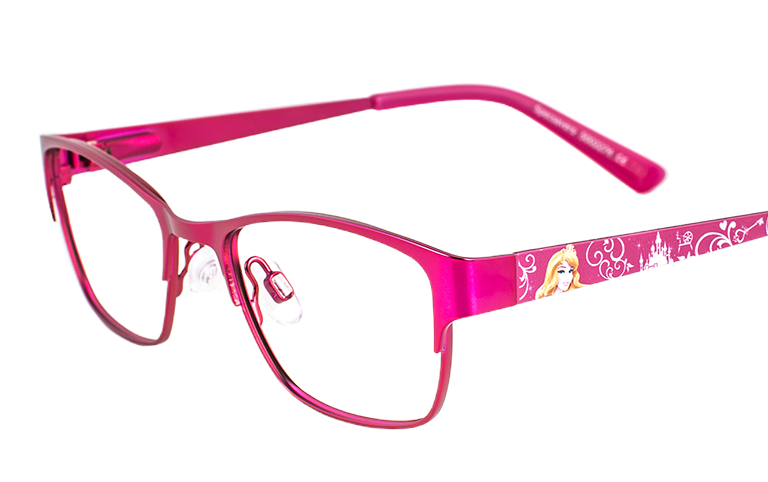 Clear and sparkly, to shiny burgundy, they all feature your favourite Disney princessess - Sleeping Beauty, Cinderella, Rapunzel, and Mulan. 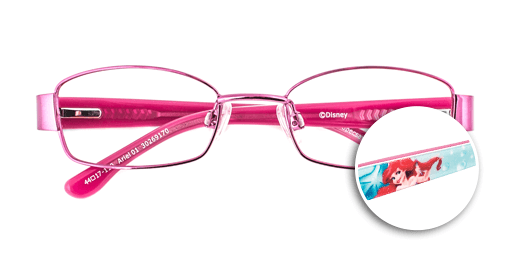 All Disney frames come with single-vision lenses and are part of our kids two for one offer. 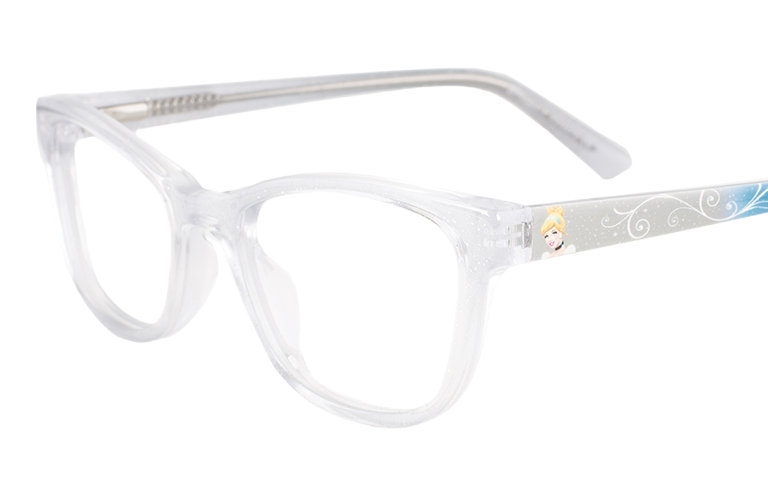 Little princesses will love the pretty sparkle-effect of this limited edition clear acetate frame. 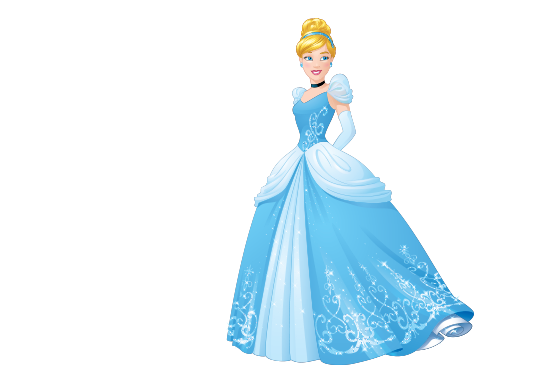 Cinderella smiles on pale grey to icy blue ombré-effect sides - ready and dressed to go to the ball. SKU 30706200. 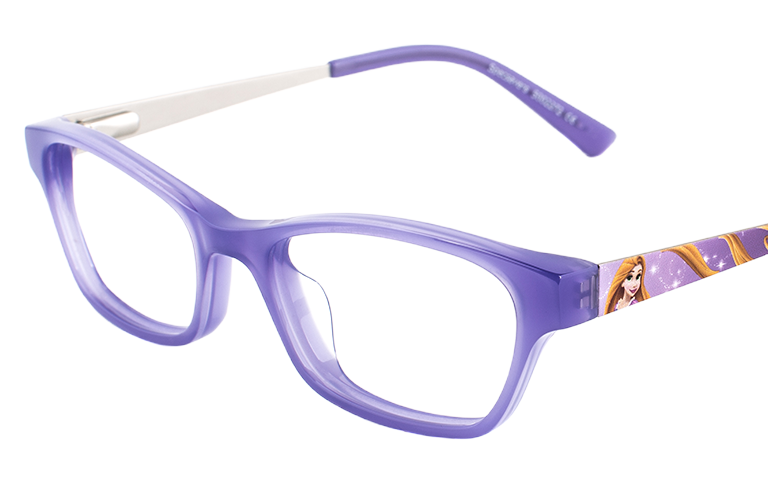 This pretty satin purple frame in flat sheet metal perfectly matches the sparkly, acetate tips. 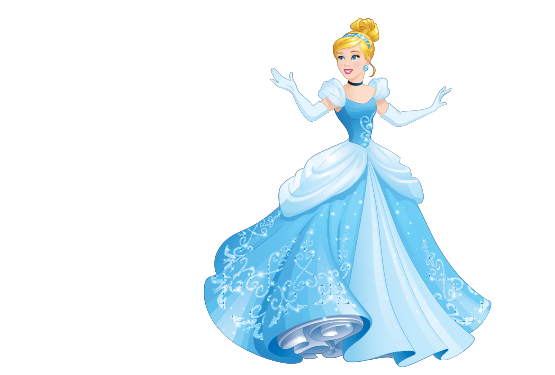 While icy blue sides feature the Fairy Godmother's magical swirling pattern that transforms Cinderella into a Princess - ready for the ball. 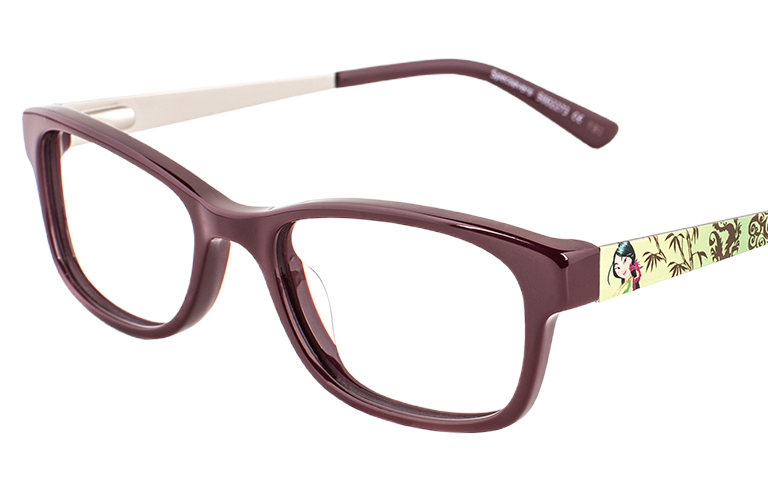 SKU 30706194. 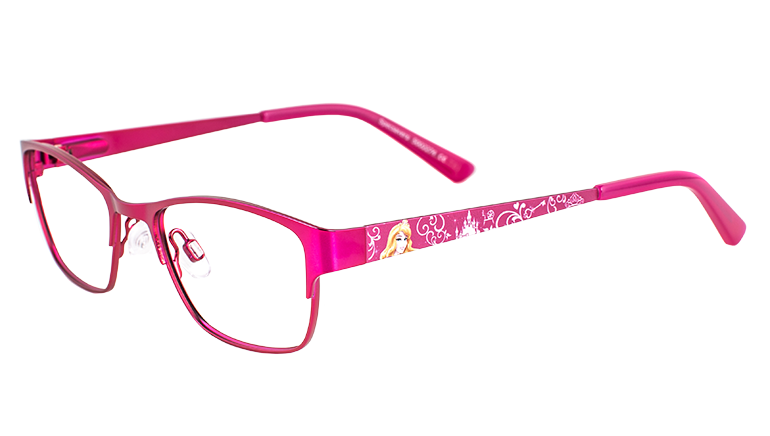 The beautiful Princess Aurora features on the digital-print metal temples of this shiny raspberry-coloured frame complete with silhouettes of the spinning wheel, and her Prince's palace where she lives happily ever after. 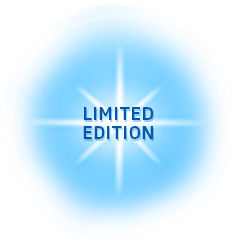 SKU 30706231. 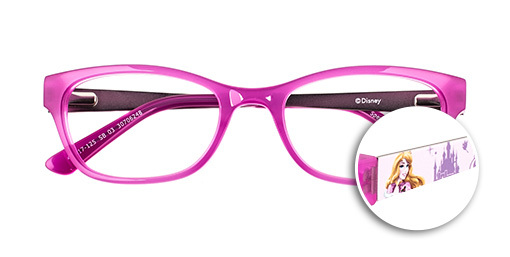 Sleeping Beauty fans will love these bright, bubblegum pink frames. 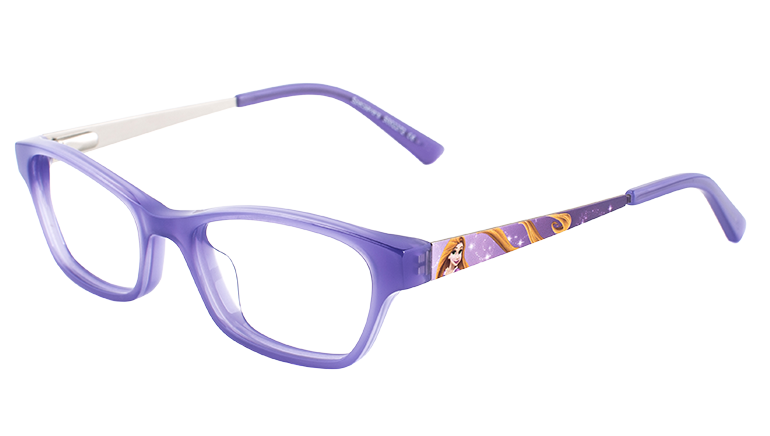 A smiling Princess Aurora features on the pale pink sides, along with story-telling character details in purple. 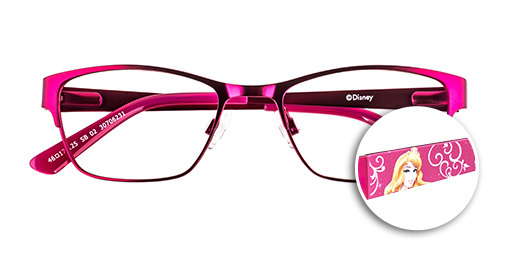 SKU 30706248. 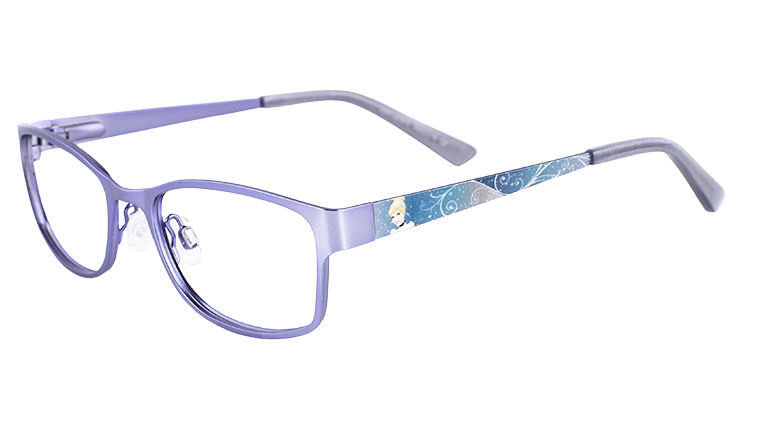 Rapunzel herself smiles on the sides of this pretty purple frame in comfy acetate, with her beautiful, swirling long locks flowing across the metal sides. SKU 30706217. 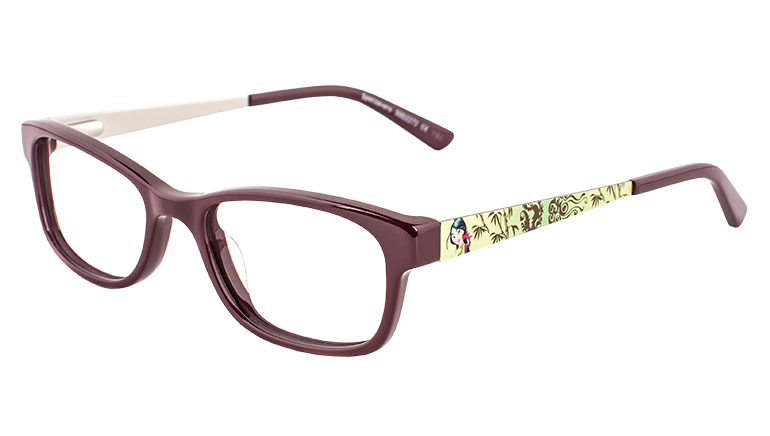 A shiny burgundy front contrasts with pretty green sides and an oriental-inspired pattern. 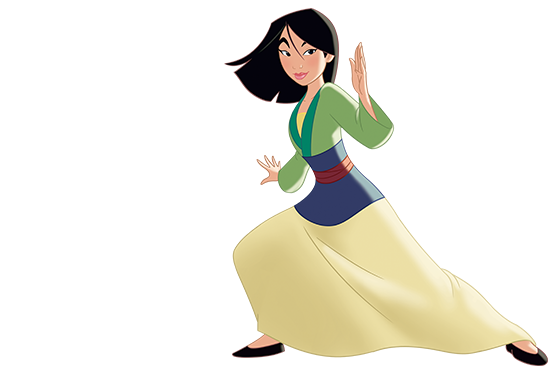 Mulan and her mischievous sidekick, Mushu, sit proudly on the temples - the perfect companions for your little adventurer. 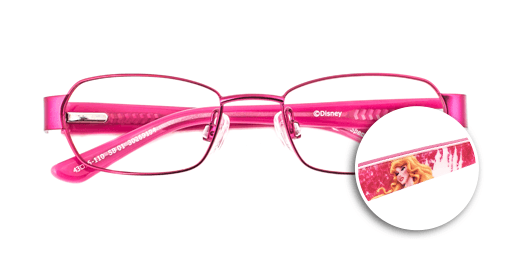 SKU 30706224. The metal front and tri-layered HD acetate-plastic temples of this magical frame are the same cerise pink as Aurora’s ball gown. 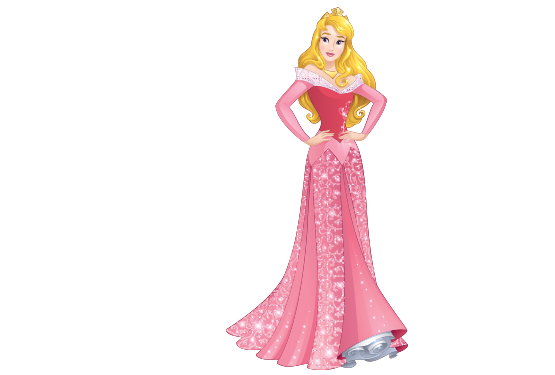 The princess herself is pictured on the temples, alongside Prince Phillip’s castle, where they live happily ever after. 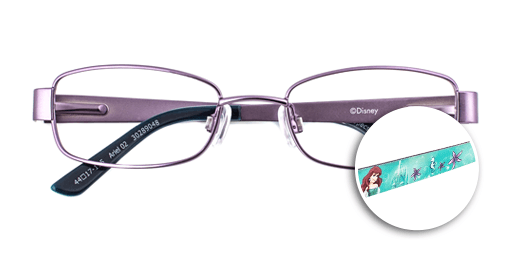 SKU 30269194. 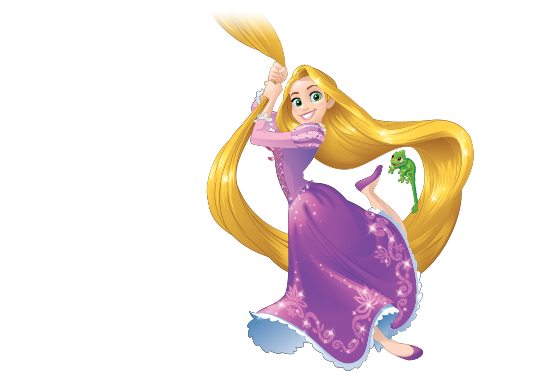 Fans of Tangled will love this frame, in which each temple has been transformed into a braid of Rapunzel’s magical, blonde hair. 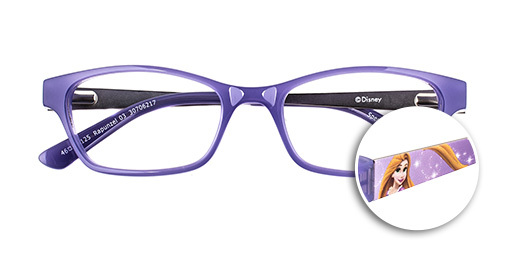 The metal front and the pearlescent, acetate-plastic temple tips are both rich, dark purple. SKU 30289031. 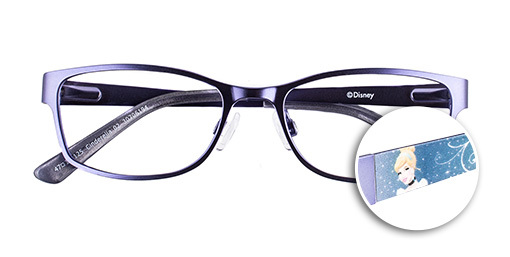 This satin-blue metal frame has dual-layered temples in navy and pearlescent blue. 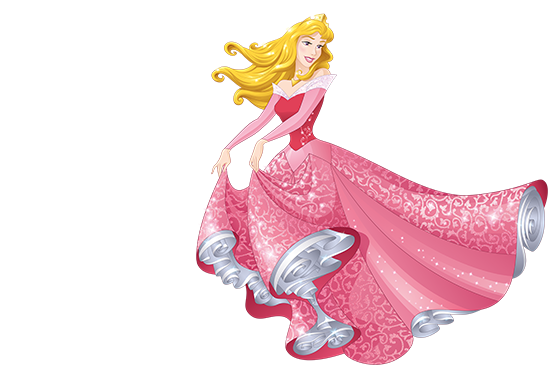 Our heroine appears on the digital-print metal temples, complete with silhouettes of her pumpkin carriage, glass slipper and the royal palace. 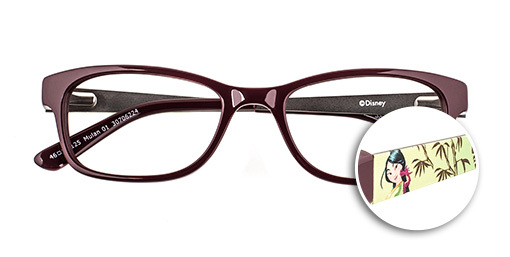 SKU 30289024. 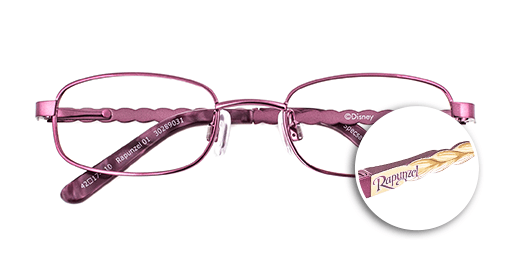 Show your adventurous side with this Ariel-inspired shiny, pink metal frame. 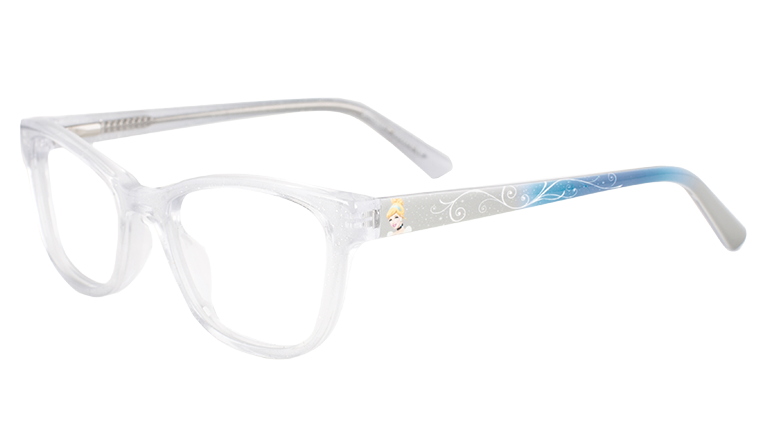 You’ll love the sparkle-effect plastic acetate temples, which depict the underwater Princess brushing her long hair surrounded by coral and starfish. 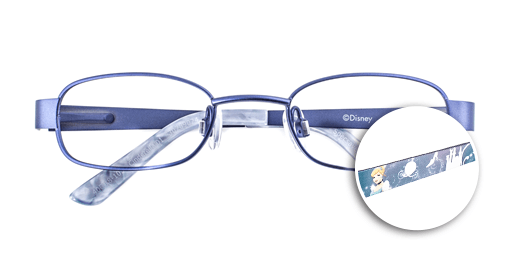 SKU 30269170. 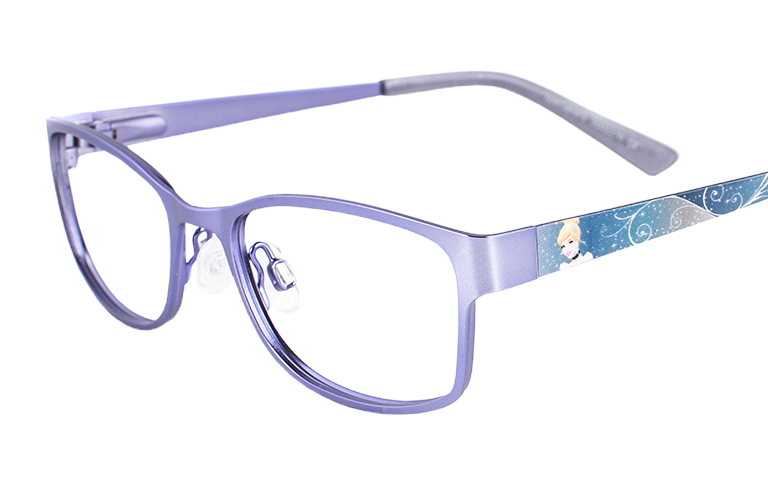 Ariel is her human self in this frame, which has a satin light-purple front and turquoise, wave-effect plastic temple tips. Her and Prince Eric’s castle features on the sides. 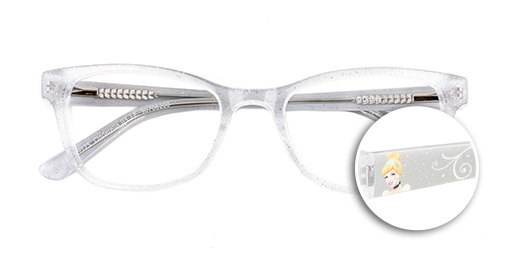 SKU 30289048.